Image Credit: Reference Technologies Inc.
November 4, 2015 – A collaborative effort involving six counties, the University of Colorado Boulder and the nonprofit aerospace advocacy group, UAS Colorado, has paved the way for the launch and testing of two unmanned aircraft systems (UAS) in the San Luis Valley. The Federal Aviation Administration (FAA) has awarded two Certificates of Authorization (COA) for the aircraft to fly in an 8,000-square-mile air space in the San Luis Valley to heights of 15,000 feet. San Luis Valley’s Leach Airport in Center, Colorado, will be the primary operations hub for UAS testing in the valley, with participation by number of other airports scattered across the valley, said Alamosa County Attorney Jason Kelly. 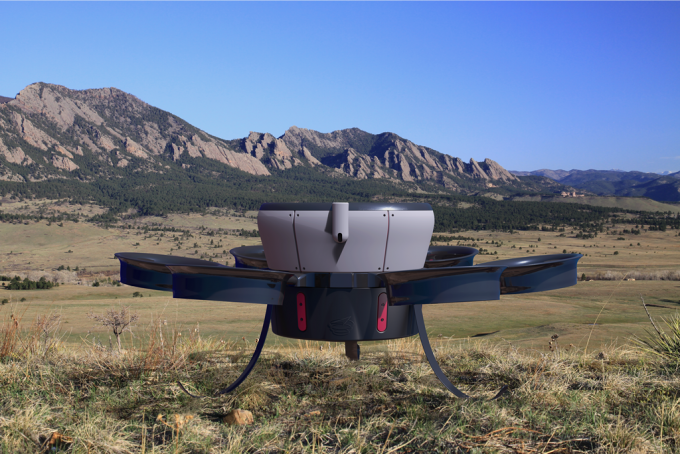 The FAA has approved two types of UAS for flight there: a 120-pound vertical takeoff craft known as the Reference Technologies Hummingbird and a smaller, battery-powered UAS that is being developed jointly by Black Swift Technologies and Swift Engineering and which can be hand-launched with a payload of up to 8 pounds. Reference Technologies Inc. is headquartered in Lafayette, Colorado, while Black Swift Technologies, headquartered in Boulder, is a start-up company founded by CU-Boulder alumni Jack Elston, Maciej Stachura and Cory Dixon. According to CU-Boulder aerospace engineering sciences Professor Brian Argrow, the collaborative effort to obtain the San Luis Valley air space from the FAA involved working closely with air traffic controllers at the Denver Air Route Traffic Control Center in Longmont to enable the UAS flights to be cleared up to 15,000 feet. “We see this as a major accomplishment for UAS operations in Colorado,” said Argrow.